The participants’ passion energized the conference. Some talked about their work with mayors and city councils, while others described their frustrations finding inroads into certain groups. 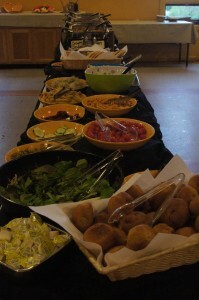 Participants spent time together over meals, team exercises, and free moments, and shared their success, struggles, and ambitions with one another. They generated ideas together, and some agreed to work together on future projects. Most expressed that the most valuable part of the Institute was being together to learn from one another. On October 5-8, the Johns Hopkins Center for a Livable Future hosted the Chesapeake Food Policy Leadership Institute for food policy groups from the Chesapeake region. The conference took place at the Pearlstone Conference Center in Reisterstown, Maryland. The goal of the Institute was to build a network of food policy leaders who can increase their efficacy in leading food policy groups and improve their understanding of food policy actions. Representatives from Delaware, Maryland, New Jersey, Pennsylvania, Virginia, Washington D.C., and West Virginia gathered at this rural location, surrounded by woods, a small farm, and walking trails. Our meals included vegetables picked from the Pearlstone organic garden and the location set the tone for what we were hoping to achieve: how our work can contribute to what is needed to develop a strong, sustainable, and just food system for the Chesapeake region. 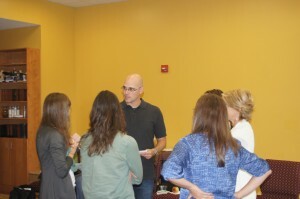 The learning sessions were designed to help participants learn how best to achieve that goal. 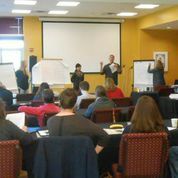 The sessions began with an exercise and discussion that illustrated common leadership and group dynamic struggles, and methods for overcoming them. We discussed shared visions, and the steps necessary to build a strong food policy council and how to work with elected officials. We then talked about group decision-making and ways to ensure all pertinent information is brought to bear. Participants broke into five small groups to work on a food policy council case study, which they presented the last day. On Day Two we discussed ways to frame our messages and other communication tactics for policy change. We also reviewed methods for monitoring and evaluating our work using logic models and other tools. Other sessions focused on using existing resources to access federal funding and to conduct food system assessments, and mapping technology. One of the highlights of the Institute was a session on how to identify effective local and state policies, which was followed by a session about which proposed policy changes would be most appropriate to meet the tasks of food policy councils. The sessions often used the knowledge of the presenters along with the experience of the participants. Participants were encouraged to speak often, give their opinions and share anecdotes, and even disagree. The participants’ contributions helped root the conference in real-world scenarios. It was the goal of CLF that participants leave with knowledge, strategies, and tactics that would have immediate impact, rather than being merely ideal theories, and that the participants would build relationships that fostered that learning. The evening activities moved us towards the goal of fostering rich relationships between all involved, participants and moderators alike. We laughed at the “best of times and worst of times” stories, roasted marshmallows, and exchanged local foods made from our respective areas. There was a palatable buzz in the dining area and between sessions as we became more familiar with one another and our respective work. At the close of the conference, we discussed how to engage our modest network of 36 people strong, via an online platform where we can continue to learn from one another as we discuss our successes and challenges. We vowed to stay connected with one another as we headed back to our respective areas with new tools, new relationships and new opportunities to contribute to rebuilding the Chesapeake region’s food system.